And sometimes those teachers are not who I thought they were going to be. That’s what I’ve been discovering on Tuesday afternoons. 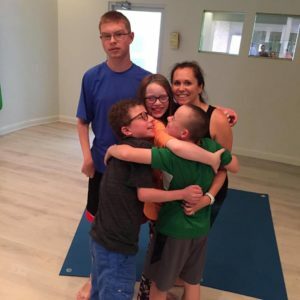 I teach a yoga class to kids with special needs. It’s the simple truths they demonstrate in each class that have me feeling like they are teaching me more than I’m teaching them. Because I can know all of these things, but they are actually living them, which drives it home so much clearer. When you think you’ve given it your best shot, go further, that’s where true growth comes from. One of my students has cerebral palsy. He can’t do all of the poses, but he is so adamant about trying, and then he will blow me away with wanting to go further, or holding the pose longer. I watch him push himself. He lifts his leg a little higher and doesn’t let himself off the hook, because he certainly could, but he keeps going. And that’s where it is, where the magic happens, in that point that is further than where we imagined we would go – that precious point where we hold onto hope instead of doubt. These kids are showing me (as most kids do, really) that we take life WAY TOO SERIOUSLY. Bills, deadlines, to-do lists and general adulting has taken a toll on our sense of humor. Sometimes we give all the hard stuff a front seat and forget it’s just part of life. We are the creators of our lives, which means we will have responsibilities. But we can shift our focus and choose to look at those things differently. Maybe the stress we are feeling is a call to reprioritize where we focus our energy. Maybe the seriousness is a call from our spirit that it’s time to lighten up. In class the kids like to hoot and holler and make jokes. They still get their work done, but they laugh along the way, and they laugh at themselves. And isn’t that the best laugh at all – when we can laugh at ourselves? While they may all have special needs, their needs are different. So trying looks different for each one of them. But they never, ever compare themselves, or get mad because the other one can do something they can’t do. They are so focused on what’s going on with their practice and the fun they are having that comparison has no room. So instead, when their classmate gets into a pose that’s difficult…they celebrate! Celebration feels far better than comparison every single time. Now it has become a regular thing, I get a hug before they leave the room. And real hugs, no half hug with one arm, but both arms full hug because I mean it kind of hug. It seals in the precious time we just spent together and is so worth the extra few seconds it takes. We each feel noticed and appreciated and VALUED. And isn’t this why we are here, anyway? To notice each other and celebrate who we are together? A hug can do that. It’s that powerful. I look forward to Tuesday every week. I know I will laugh, and be reminded to let go, and share a space with people who are all in, and who stay true to what matters, and remind me to do the same. I’m grateful for these teachers. And I kind of wonder what they would think if they knew I was writing to you about what they’ve taught me. PS I have another Mommy Reset Workshop coming up on Saturday, November 4th! The last workshop was such a positive change for all the women who attended. If you feel called to join me, I hope you do. It will be a transformative, fun few hours that will make a difference in your life. Home >> General >> Taking life too seriously, bad hugs and growth. Why Tuesdays are one of my fave days.